Are you looking for wedding lighting? Lighting can’t be ignored when it comes to wedding decor. This is because it has a great impact on the overall look of your wedding reception. If the lighting is fabulous, it can change the ordinary look of a room into a stunning dream wedding as various lighting effects, and colors are needed to create different moods and atmospheres throughout a wedding event. When it comes to lighting, you can count on Sean Garrity Events & Production. Our lighting experts are capable of turning your dream into reality. Whether you need a custom dance floor lighting, special neon lighting effects or just a traditional wedding lighting, we got it all covered. The guests at the wedding always want to see new couple’s first dance, cake cutting, and to see the bride toss the bouquet, etc. Our lighting experts will illuminate such moments to make your wedding ceremony stunning and your photos gorgeous as you always hoped. There’s no doubt that cake cutting is the high point in a wedding reception. The guests entering the reception look for the cake first; they want to see how beautiful it looks and how big it is. 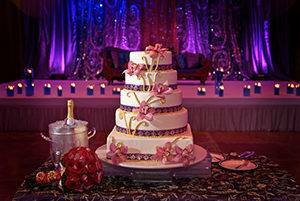 Therefore, proper lighting is important because it will highlight the cake during your reception. Our lighting technicians will design the lighting according to your desires and then install it professionally in such way that every aspect of your special night will shine, ensuring that every moment of your wedding is stunning. We all know the impact of lighting on a dance floor. 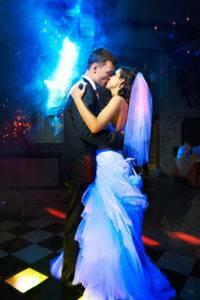 If the guests at your wedding love dancing, then you can get the party started with proper dance floor lighting, for example, a moving follow spot for featured dance such as romantic first bridal dance. We can also make the floor come alive with colored wash lights as well as automated lights that offer color changes, movements, and strobe effects. 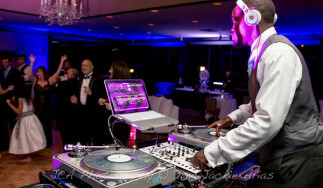 Our lighting technicians can create any dance floor atmosphere you want for your wedding. Tents make great temporary structures for wedding receptions. However, tents also present a lighting challenge. If the lighting is done properly and professionally, it can transform an ordinary tent into a beautiful gathering place. Our lighting experts will create lighting designs based on the tent size or number of guests to enhance perfectly the mood set in the tent. You can make your wedding ceremony unique with custom geometric or organic lighting shapes. You can ask for any lighting design of your choice, and we will make sure to give your wedding an enchanting and personalized look. Many couples love to project a monogram to set the perfect scene. There are many places you can use it, for example, you can shine your desired pattern behind the bridal table, in front of your entrance, or onto the dance floor and walls. We at Sean Garrity Events & Production pay close attention to the smallest details when it comes to providing excellent customer satisfaction. Don’t hesitate to call us at 954-464-5900 or click fill out our contact form for more details!